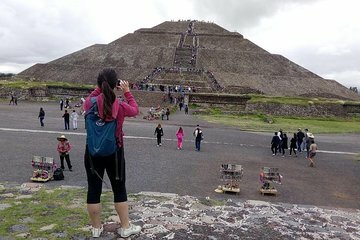 Ontdek het beste van Teotihuacán en zijn minder bekende edelstenen tijdens deze volledige dagrondleiding vanuit Mexico-Stad. Bekijk de topattracties van UNESCO Werelderfgoed, zoals de Quetzalcoatl, Sun en Moon piramides, evenals muurschilderingen en het Butterfly Palace. Bezoek een obsidiaan workshop en proef pulque en tonijnproducten in lokale fabrieken. Upgrade uw ervaring met een fietstocht zonder extra kosten! Lunchbuffet en hoteltransport inbegrepen. Deze Teotihuacan-tour vanuit Mexico-Stad bestaat uit lunch, fietstochten en een bezoek aan een lokale obsidiaan workshop. Well organized and fun way to see this historical site.You still see all the main ruins but your guide also takes you to smaller archaeological areas outside the main grounds. Small group with friendly caring guide. Hotel pickup from Mexico city was excellent. Biking was easy and most people would have no issues keeping up.The included lunch was excellent, our group ate in an underground restuarant which was a great surprise. Well organised tour. Driver arrived on time and battled through the traffic. Four guests including us went on the walking tour and three others joined a bike tour. The walk was easy enough, except for climbing the pyramids of course. It was a warm and pleasant day, but not too hot and we did not have to wait to go up. This was followed by a snack (included in price) and another visit to a site with beautiful paintings. Then a quick visit to learn about pulque and obsidian. Optional purchases, but no pressure. Followed by lunch (included) and then the traffic back to our hotel (back by 6pm) Overall very well organised, so would use this company again. The sights are amazing. The guide and driver both spoke very good English and it was great to have a chance to find out about daily life in modern Mexico at the same time. We had a great time! Our guide was excellent and the pyramids were enchanting. We were picked up from our hotel in Condesa at 8am and driven to Teotihuacán where we met our guide, Miguel. It was nice to head to the pyramids early in the morning. There was hardly any crowd, which was convenient for capturing amazing pictures. Miguel gave us plenty of time to climb both the sun and the moon temples and walked us along the avenue of the dead. He was very patient and answered all of our questions. The highlight of the trip ended up being the visits to the different ruins with mural paintings. It is not something a lot of tourists visit. We picked Miguel’s brain on history, Mexico City, culture and food. It was a lot of fun chatting with him throughout the tour. The quesadilla snack and lunch were ok. Overall, we were quite pleased to book this tour. We enjoyed this full day tour of Teotihuacán. The pick-up was punctual and the ride to Teotihuacan was comfortable. The site is amazing. Our guide was enthusiastic and knowledgeable. We chose the bike tour of the surrounding area. The sites are the same whether you bike or not. Although the biking is flat some of the paths are difficult for those not used to riding bikes and one of our group fell. We also enjoyed the various stops, especially stopping for a snack to watch, and help in making, quesadillas. A very worthwhile way to explore Teotihuacan and its surroundings. As we were just two guests and our great guide Luis it was like a private tour. Saw many sites at Teotihuacan than regular tours don't include and received a great deal of interesting information about them. Visits to the restaurant to watch the preparation of traditional foods and to the family run business specializing in a wide variety of products - liqueurs, salsas, soaps etc. - from cactus were amazing. It makes for a rewarding experience to have a knowledgeable and friendly guide like Alex to take you round such a fascinating site. He took great care that we experienced the site apart from other groups so that taking photos and listening to details at each of the stops we made within the tour were undisturbed by other visitors. Climbing the two Sun and Moon pyramids and gaining a panoramic view of this magnificent site were hugely enjoyable although I'd say if you had any health issues or are unsteady on your feet I'd give be very careful about attempting them. After the visit to the pyramids there is a stop for lunch. Not the best part of the trip for me. Wasn't best impressed by the food available but my companions seemed to be happy with it. There is the option of ordering from the menu or a buffet. There's also a tequila and mescal tasting session beforehand. All in all it's a good idea to go early and catch this place as the day starts. It's April now and it's not the warmest when the sun's not up so with an early start take a light jacket or long-sleeved top to cover the first few hours. After that it heats up. I'd recommend this tour to any of my friends if they were visiting. Very enjoyable. Luis and the rest of the team were dedicated and helpful guides for our day in Teotihuacan. We booked the bike tour which was very fun and they were careful to go at our pace and even called a car when one of our trip was having difficulty, so she could be driven the rest of the way the bike tour should be fine for most riders! It was just hard for her because she hadn't biked in ages. Definitely recommend this tour and also the taco stand outside the pyramid gates! Those were amazing! Our guide was Luis and driver was Anjelica. Both very pleasant and welcoming. Luis was a very informative guide. This was GREAT value for money. There were just two of us so we were able to go at our own pace. Anjelica met us at our hotel and drove us to the pyramids site where Luis was waiting for us. After the walking and climbing, we stopped for a local snack and then visited two more sites where the murals were so clear. Then lunch and the drive back to our hotel. One more thing, we booked this trip just one day in advance yet everything went like clockwork. Excelente, el recorrido con bici y caminando es muy completo. Pensé por un momento que sería muy cansado pero en realidad es mucho más suave porque el recorrido en bici es plano, además recorres parte de lo que debes hacer a pie más otros lugares y ya luego conoces las pirámides a pie. La comida típica que incluyen es muy rica.